Pete grew up in Norfolk, in the Annunciation community; active in G.O.Y.A., in Boy Scouts, and as an altar boy. After graduating from U.N.C., Pete joined the family foodservice business. in 1979, he moved to Raleigh, N.C. to run Galanides, Inc., Raleigh branch. He attended Holy Trinity G.O.C. and served as Parish Council Treasurer and President. In 1997, Pete made a career change. He received training as a mediator, pursued post-graduate education at the Columbia College Conflict Resolution Program, and worked as a mediator, trainer and mentor at Carolina Dispute Settlement Services. Pete and Elaine married in 2006, after dating off-and-on for 37 years. Both are active in the life of the St. Nicholas community. I began serving on the Parish Council at St. Nicholas in January 2018. Growing up and into adulthood I was a nominal Christian with a Protestant background, never being grounded in regular church participation or attendence. My heart began seeking to become a part of a faith community. The next question was where? The choices were endless. At the suggestion of the dear man in my life, Justin, I attended St. Nicholas for the first time a few years ago. I was blown away by the warmth and kindness shown to me as a visitor and, at the invitation of a precious woman I met in the social hall, I began attending the women's bible study and liturgy more regularly. After much prayer, studying, and three years of attending St. Nicholas, two of my children and I were Baptized and Chrismated into the Orthodox Church in 2016. Simply put, becoming Orthodox has changed my life and my family's lives more than we could have ever imagined. I have been overwhelmed in witnessing the amount of time, love, and hearts of service of the members of this parish and I feel honored to be a part of your Parish Council, Glory to God. I am a dental hygienist and have lived and worked in the Great Bridge area of Chesapeake for many years but lived in many other areas as a child due to my father's naval career. I have three sons and 2 dogs. I love the beach, good coffee, being outdoors, and the company of friends and family. Widower, 1 step daughter, 2 grandchildren, 2 great grandchildren. One of first members when services held at school. Served on board once before. Moved to V.B. From Mass. Early 70's with small pharmaceutical co. After a few years, became partner and then sole owner of Jimmy's Pizza Hilltop for 25 years. After that food service manager for Greyhound Bus for 8 years, independent sales manager for Greyhound for 4 years. General Manager for Virginia Originals/ Chesapeake Grill on the CBBT for 6 years until unit was closed for construction of second tunnel in 2017. Retired now. I am a first generation Greek American hailing from Pittsburg Pennsylvania. My mother was an Icarian and my father was an Andriote. My grandparents were original members of the Icarian Club that was started in Pittsburgh and is housed in my home town. Many moons ago I graduated from IUP with a BS Ed in Exceptional Children. When I lived in frigid Elkins, WV I completed a Masters in Elementary Education at West Virginia University. Currently I am a teacher for Virginia Beach City Schools. My classroom is a self-contained special ed class with autistic, delayed, and emotionally disturbed children. I love them! I am happy to serve as a Sunday School teacher, and now a Parish Council member. Being from Pittsburgh I am an avid (or crazy) Steelers fan, but I have other talents as well. I sew, crochet, paint, make jewelry and indulge in other crafts, so save me your yarn ends and broken jewelry and come join me! Dan has been in the Tidewater area since 1984. He served six years in the United State Navy and left to pursue a full-time accounting career in 1990. After leaving the Navy in 1990, he began an eleven-year career as a civilian with the United States Coast Guard as Chief of Accounting for the Fifth District. In June of 2001, he left the Coast Guard to begin his own comprehensive financial planning and advisory firm, Cook Financial Designs, which he continues to operate today along with a tax preparation business. He has served as a board member on the Tidewater Chapter of the Virginia Society of CPA’s since 2002. He has been an active member of St. Nicholas since 2002 and has been married to Louisa Cook who is one of the greatest blessings he has ever received. Born in New York City, Flo moved to this area with her parents and sister at 3 years old. She attended Granby High School and Old Dominion University, where she earned a B.A. In English and a M.S. In Education/Library Science. After 33 years of teaching English, journalism and being a librarian,she retired from the Virginia Beach School System. She spends her time now volunteering for the church , gardening and taking care of her dog. I grew up in Norfolk, Virginia where my whole big fat greek cypriot american family attended our beloved Annunciation Cathedral. My parents set the stage for our love for our community by being involved as President of the Parish Council and my mom was on the executive board of the Hellenic Woman's club for years and supported our parish. My grandfather, Christos, was the greek school teacher , choir director, and organist for many years. He even wrote a liturgy. And accomplishment reconized by the Archiodioese. I was blessed to be married to my dear husband, George, for 36 years. May His Memory Be Eternal. We have a wonderful blended family: a son and three daughters, who are dedicated and loving. My three grandsons are my entire life. I pray that they grow up loving our church as have all of our children. After graduating from ODU in 1969, I received my masters from Middlebury College abroad in Madrid, I taught Spanish for over 31 Years at First Colonial High School and adored my students. I tutor students and adults in my spare time, but mostley I am blessed to take care of my two grandsons, Evan, (3) and Niko (1). I now serve on the Parish Council at St. Nicholas. 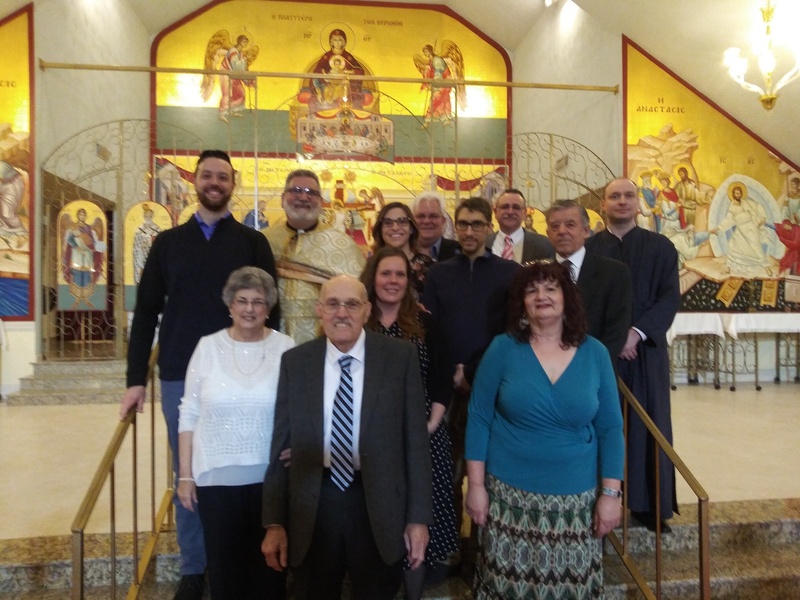 Alex Divaris became a member of St. Nicholas Greek Orthodox Church when he was 3 years old, after moving to Virginia Beach from Cape Town, South Africa in 1982. He is a graduate of the College of William and Mary, where he met the love of his life and future wife, Emily. Together they have two adorably spirited children, Gabriel and Hazel, and a really fluffy West Highland Terrier named Trot. Alex has enjoyed a 15-year career in commercial real estate as the Vice President of Investment Sales for Divaris Real Estate, as well as the Owner/Director of Creative Synergy for Town Center Office Suites. He sits on the Board of Directors for the Central Business District Association, CBDX, Generation MOCA, Hampton Roads Public Transportation Alliance and Light Rail Now. In his spare time, Alex loves skiing, golf, reading, movies and considers himself a bit of an expert at most trivia. Dennis Economos, has been happily married to his lovely wife, Debbie, for 39 years. They have three grown daughters and three young grandchildren; spending time with my family is a top priority. Dennis was self-employed and retired about 4 years ago. Dennis has always enjoyed working with his hands and always happy for the opportunity to continue this hobby at St. Nicholas where he has attended services for the past 6 years. "John T. Moxen, Ph.D, is the husband to his wife, Melissa, and the proud father of his four children, Addy, Brielle, Colin, and Demi. John manages the national programs for FOCUS North America, a pan-Orthodox basic needs organization. With a heart for education, he serves as a Christian Education teacher at St. Nicholas. John's interest in ecclesial leadership is satisfied through his service of the Parish Council." Goran was born in the beautiful country of Serbia, and in 2008 he came to Virginia Beach, just to visit. :) Soon after, he met Laura and that changed his plans. They together joined St. Nicholas in February of 2008, but had to leave Virginia Beach twice. They lived in Richmond for about 9 months, and in the Czech Republic for a year. Even though they were away, St. Nicholas has always remained their home. They got married in our church, and their daughter Lea and son Basil were baptized here as well. In early 2014 Goran became a "cantor in training" and few months later he was asked to be a member of the parish council. Goran does not have a lot of free time because he works full time in a restaurant and is in the school, but he enjoys his life. In the summertime he likes biking, running and hiking and in the wintertime he loves Netflix. He loves history, coin collecting and traveling. Chris is a native of Cyprus and immigrated to the United States in 1975 after the Turkish Invasion of Cyprus. Chris and his wife Cheryl have three children Anna, Emily, and Michael. They have been members of St Nicholas Greek Orthodox Church for approximately 14 years. Chris is an accountant and the Managing Partner for KPMG's Norfolk office. He is active in various community organizations including the Greater Norfolk Corporation, The United Way, The Virginia Beach Neptune Festival, the Hampton Roads Economic Development Alliance and others. Chris and Cheryl enjoy spending time with their family and attending their children's activities including soccer, swimming, basketball, lacrosse, cross country, musicals and school plays. Chris is a graduate of Virginia Tech where he currently Chairs the Advisory Board for the Department of Accounting and Information Systems and is an avid Hokies fan.